Yesterday, journalists following the story of 7 accused Islamic terrorists on trial in Great Britain reported that one of the jihadists, Salahuddin Amin, was involved in discussions to buy an atomic bomb! An FBI informant who has pleaded guilty in the United States to links with al-Qaida testifies against alleged terrorists in a British court on Thursday. 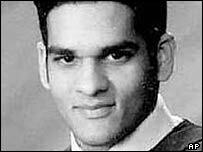 Mohammed Junaid Babar, 30, a US citizen of Pakistani descent, (In 2004, Babar admitted to smuggling money and military supplies to a senior member of al Qaeda in Pakistan, setting up a jihad training camp and assisting in a bombing plot in the United Kingdom.) will be protected by teams of police motorcyclists and by armed officers, as he is transported from a high-security police station in north London to the Central Criminal Court in the capital. He pleaded guilty to various terrorist offenses at a federal court in New York in 2004 and described traveling to the Pakistani province of Waziristan to supply cash and military equipment to al-Qaida suspects. Two of the charges related to what US prosecutors described as the “British bombing plot,” prosecutor David Waters has told a jury at London’s Central Criminal Court. At alleged terror training camps in Pakistan, Babar helped plot an attack on Britain with a group of seven British men, supplying them with details to make an ammonium nitrate fertilizer bomb, Waters said. Following his arrest, Babar provided other information to the FBI about different planned terrorist attacks on Britain. When Mounties raided the Ottawa residence of Momin Khawaja two years ago, they found homemade electronic equipment to detonate bombs in London and elsewhere in the United Kingdom, possibly including Europe’s largest shopping centre, a British prosecutor revealed in court yesterday. They also discovered unspecified “documents” about Islamic jihad, or holy war, and Mr. Khawaja’s “radical views in that direction,” Crown attorney David Waters told the Old Bailey trial of seven young Britons charged with plotting a terror campaign against Britain for its support of the U.S. war against Islamic extremists. The men deny the charges. Police later recovered e-mails allegedly written by Mr. Khawaja to one of the men on trial. They detailed his efforts in late 2003 and early 2004 from his family’s home to make remote-controlled detonators with electronic transmitters and receivers. “Then we get fireworks,” said one message. The charges in the trial do not involve any radiological element. The jury has been told, however, that the British-based gang was in the final stages of a conspiracy to use ammonium nitrate and aluminium powder, with remote-controlled detonators supplied by a Canadian fellow Muslim “jihadi”, to bomb Britain. The detonators were said to be capable of exploding a device at a range of up to one and a quarter miles. The gang may have planned three bombs, according to evidence from a police and MI5 bugging operation. They allegedly had more than half a ton of ammonium nitrate. Although no precise targets had been selected, several had been discussed, Mr Waters said. At the home of Khyam and his brother Shujah Mahmood, police found “a long list of synagogues”. The Jawa Report is also on this story today. Terrorist on Trial Has Atom Bomb Links!